Buy the Farm . 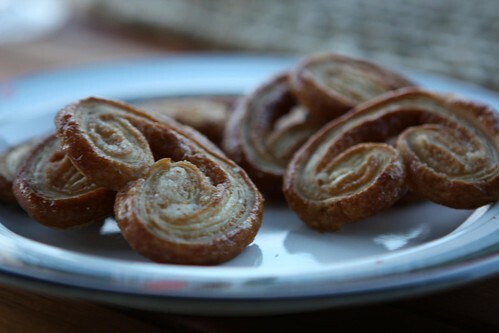 . . Share: Swiss Please! After a long day of travel yesterday we arrived in Switzerland early this morning. However, this travel was not without incident. On the plane Jen and I were separated for some reason and a nasty woman sitting beside me refused to give switch seats with Jen, even though she was traveling alone and it meant having the exact same aisle seat only one row in front of where she was. Here is what she looked like as she slept. I took a picture of her while she was unconscious but for legal purposes I selected this photo from Google Images to use instead. It's fine because it's pretty much exactly like what she looked like. Except for the joie de vivre. While I believe she did take joy in making those around her unhappy she wasn't quite as pleased as the woman in this picture. In actuality she was sour and nasty. She responded to my question about if she’d mind switching seat with my wife as if I’d shoved a lemon in her mouth and said: “Actually I would mind!” Then she spent the next twenty minutes of the taxiing sequence explaining to me how it would just be too much for her to consider such an outrageous request. This demon woman, we’ll call her Kathy, slept for most of the flight, at least for the parts where she wasn’t watching Just Go With It and sniggering to herself at the comedy genius of Adam Sandler. Either that or she was laughing about the fact that she got to sit next to me as and some fat vegetarian dude who took up his entire seat and much of mine. At least she was small. Small and crappy. Like a concentrated crap sandwich. Speaking of crap sandwiches, I would have much preferred a crap sandwich to the “food” the served on the flight. 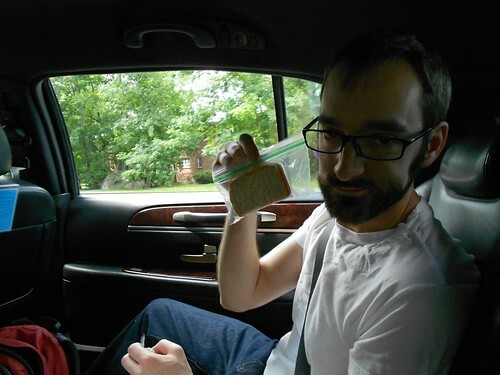 After going through the peanut butter sandwiches which I packed in accidentally purchased tiny snack bags, this food was awful. I was asked if I wanted chicken or pasta. I selected pasta since I didn’t really want to eat meat. What arrived was a tiny cardboard boat with microwaved penne and some sort of horrendous beef sauce. As a side there was a corn niblet salad and a roll in a hermetically sealed plastic bag that appeared to be covered in some sort of flour or dust. It tasted like maybe it was the powdered tears of past passengers. Also, everyone on the plane got some sort of chocolate dessert. Everyone except me. I just watched as everyone around me enjoyed their dessert. It looked like it must have been the most delicious part of the meal. That’s probably only because I didn’t taste it. I’m sure that like most of the rest of the meal it was filled with disappointment and sorrow. 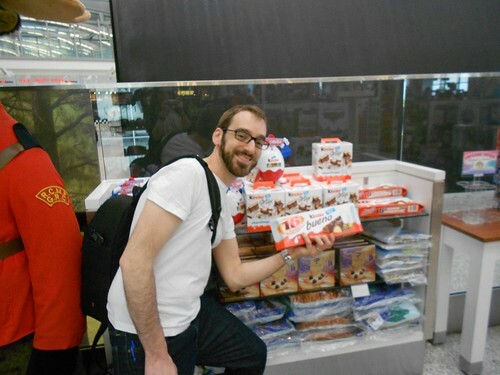 We did eventually arrive in Switzerland after stopping in Toronto (to find Kinder Bueno bars), several delayed flights, rebookings, and the captain flat out lying and telling us that the flight would only be five hours. This was a flight of betrayals. But my friend Kathy was loving every minute of it. 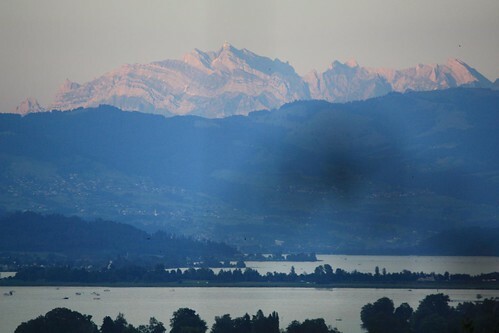 After arriving in Zurich we were picked up by Ross who carted us off to Gregg and Ross’s apartment which enjoyed this lovely view of the Swiss Alps. 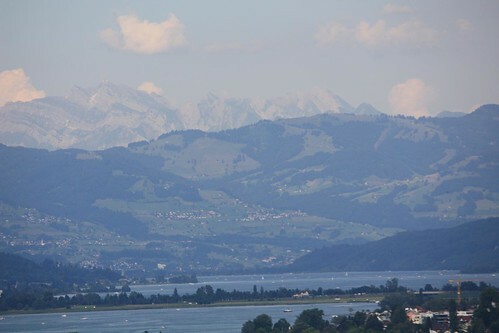 After some water and lunch we both passed out for three hours and awoke to this lovely view of Lake Zurich off the balcony. Just in time to shower and get ready for a dinner which would quickly redeem our horrible Air Canada meal. I was given, by request, a Swiss beer called Lagerbier Hell from Karlskrone. It sounds much worse than it was. 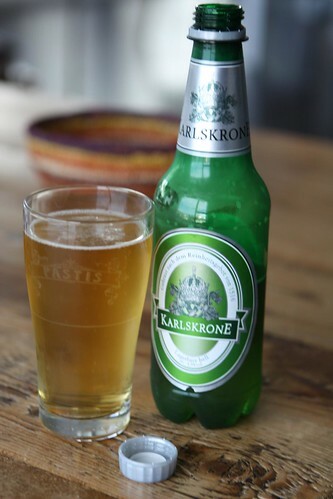 While lager isn’t generally my favorite beverage this was exactly what I needed after a long day of travel. Unfortunately after virtually no sleep the 4.9% alcohol did go straight to my head. Kathy doesn’t drink alcohol. She requested the flight attendant bring her hot tea on three occasions. Kathy thinks alcoholic drinks are for the weak. Besides, it’s easier to be completely self-absorbed when you’re in full control of all your faculties. 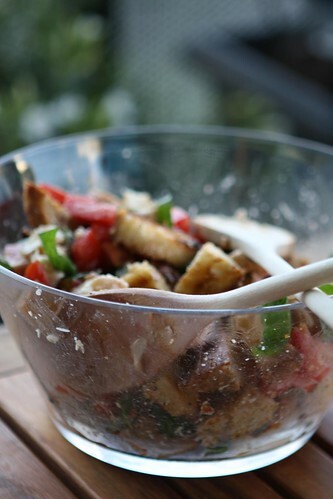 We started with a delicious salad with Roma tomatoes, toasted bread, basil, balsamic, and mozzarella. 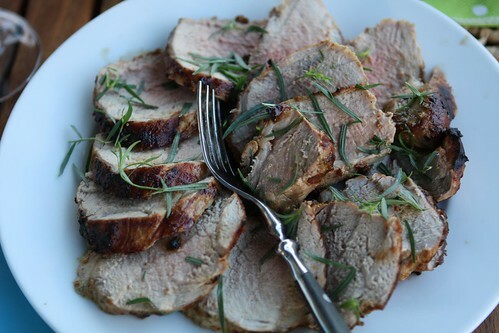 Also we had a pork tenderloin smuggled in from Canada – Swiss pork is apparently prohibitively expensive – that had been marinated in Maille tarragon mustard and grilled. 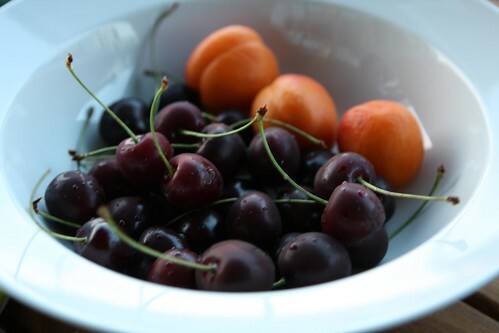 For dessert we had local Swiss apricots and cherries along with palmiers and fennel tea. After dinner I panicked a bit at the thought of trying to type a blog entry using these German keyboards. Jen couldn’t even log into her email account because she uses a “#” in her password which isn’t even present on the keyboard. Uh oh. Have I given up a valuable security secret? This was a fine close to our first day in Switzerland. Now that we’re too tired to think straight we’re going to turn in early so we can get a jump on the adventures of tomorrow! Kathy likes to avoid the mountains. Denser population means there is more happiness to neutralize if she remains on the flatlands. See you all tomorrow where we make our first trip into the city! Maybe Kathy was enjoying Nate Beaudry In "Grumpy Old Man"
So Nate, tell us how you REALLY feel about Kathy! What a biotch! 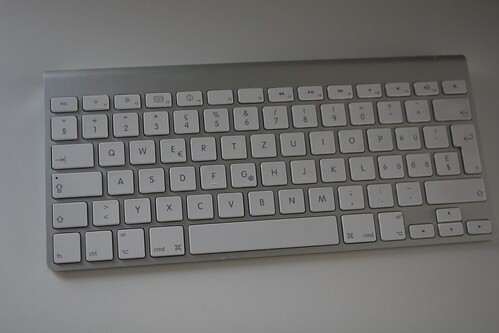 I also love how ALL the letters on the keyboard are the same except the Y and Z are switched. It's so crazy to think that all the other placements work for both languages but I just can't type with the Z in this damned spot! It needs to be switched! Thanks again, can't wait to read more about your trip! I now need to turn around and face the music of Jed and a bowl of yogurt. Use your imagination.